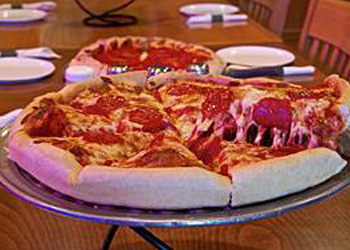 Charlie Fox is the proud recipient of the Kane County Chronicle readers’ choice award for “Best Pizza” year after year! Our award-winning pizza is made with only the highest quality ingredients. Our dough is made fresh daily. Our cheese is made with a unique blend of four premium Wisconsin cheeses. Our sauce is made from a recipe that has been perfected over the past 20 years. Everything that goes into our pizza is made in-house. We take pride in making every pizza a one-of-a-kind, mouth-watering experience! 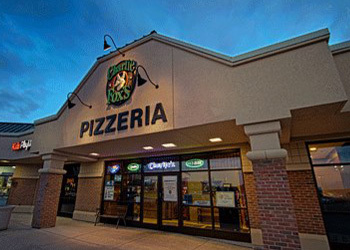 Charlie Fox of St. Charles is a family-owned and operated pizzeria that began in 1997. 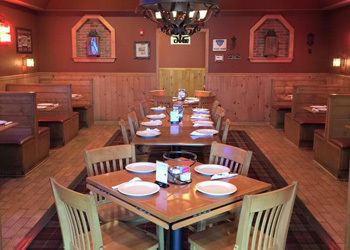 We proudly serve our award-winning pizza and offer a variety of other tasty dishes including appetizers, homemade pastas, fresh salads, and premium sandwiches, burgers, and wraps. We love serving in our community and strive to exceed your expectations every time you order with us! Please note that while we share a name with the Geneva and Batavia Charlie Fox locations, we are all independently owned and operated. We are open every day for lunch and dinner. You can order with us for delivery, carry-out, or you can enjoy our pizza straight from the oven in our cozy dining room known as the Fox’s Den! Our comfortable dining room includes rustic gas lanterns and a wood-pine embellished interior that is perfect for a family night out or any special occasion. For your next party, we offer unlimited pizza and pop party packages in our dining room that are always a crowd pleaser. We also have a delicious catering menu that includes all our homemade pasta dishes and much more!